China’s RIMPAC surveillance reveals a troubling disconnect in its interpretation of freedom of navigation. As Zach wrote earlier this week on the Flashpoints blog, Admiral Samuel J. Locklear III, commander of U.S. Pacific Command, was remarkably upbeat about the revelation that a Chinese auxiliary general-intelligence ship was shadowing the RIMPAC drills within Hawaii’s exclusive economic zone (EEZ). Locklear saw the Chinese vessel’s presence as “an acceptance by the Chinese of what we’ve been saying to them for some time, [which] is that military operations and survey operations in another country’s EEZs … are within international law and are acceptable.” China has long protested U.S. surveillance missions within China’s EEZs, while the U.S. believes waters outside the 12 nautical mile territorial zone are international waters and thus fair game for surveillance missions. Because China sent a vessel to perform reconnaissance within Hawaii’s EEZ, Locklear was hopeful China had come around to the standard international interpretation. However, a Chinese Defense Ministry spokesman made it clear that China’s position has not changed. Geng Yasheng, speaking at the ministry’s regular monthly press conference, defended the presence of China’s AGI vessel in the Hawaiian EEZ, saying that the vessel was acting in line with international law. “We hope the U.S. [will] respect the legitimate rights of the Chinese ship,” Geng said, and the U.S. navy has shown every indication of doing so. Chinese official have long listed U.S. surveillance missions as one of three factors limiting U.S.-China military relations (with the other two being U.S. arms sales to Taiwan and U.S. congressional restrictions on mil-to-mil interactions). In an indication that China will holds fast to this position, Geng argued that U.S. reconnaissance missions near China “severely compromise China’s national security and can easily trigger accidents at sea and in the air.” Indeed, recently China has seemed willing to cause such “accidents” by aggressively harassing U.S. ships that venture into its EEZ on surveillance missions, including the Victorious and the Impeccable in 2009, the George Washington in 2010, and the Impeccable again in 2013. So it seems that China wants to both vigorously defend its right to conduct reconnaissance missions near the U.S. while also denying the U.S. the same right. But how? 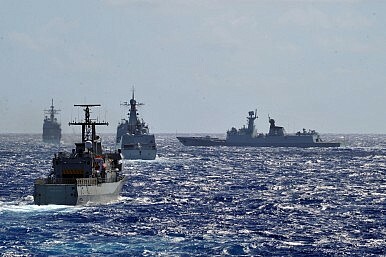 In his defense of the Chinese AGI ship’s operations near Hawaii, Geng emphasized that the mission “is in line with the international law and domestic law of the U.S.” The latter may hold the key to understanding China’s position, as Andrew S. Erickson and Emily de La Bruyere suggest in their analysis of China’s RIMPAC surveillance. Erickson and de La Bruyere point out that China wants to use domestic laws to justify its seemingly contradictory stance. The U.S., which believes in free navigation, even for surveillance activities, within EEZs, has no domestic laws restricting such missions. China does. Thus Beijing can insist upon the legality of its operations near Hawaii based on U.S. domestic law, even while denying the U.S. the same right based on Chinese domestic law. China’s position on surveillance and (more broadly) on freedom of navigation and overflight in its EEZ has important ramifications for China’s territorial disputes. Thus far, Beijing has insisted that U.S. concerns about freedom of navigation in the South China Sea are completely unfounded. But China apparently also wants to insist that all countries adhere to its domestic laws within its EEZ, an area that is more usually considered international waters. Under the Chinese “nine-dash line” claim, most of the South China Sea would fall under Beijing’s jurisdiction — and thus be closed to surveillance and reconnaissance missions.